We have been living at my parents for 5+ months now and saving is proving to be more difficult than I thought. Don't get me wrong, we have put away more than we ever had saved before, but at this rate we will be here for years in the plural to get where we were hoping to be in a year. But you know me I like to dream big so I am just hope, hope, hoping that we will figure out a new way to save more money. Or win the lottery, whichever, I'm flexible. So to continue on my DREAM BIG plans I have found a new house plan. (I know it's a big shocker.) This one is more of one of those Dream Home plans that would most likely require a lottery win to allow it to come to fruition, but I'm dreaming big today. This is a digital rendering of the front of the house. It's pretty awesome what they can do these days with technology. When I was studying drafting this would've been a sweet pencil sketch. It looks so realistic, right down to the plants and grass. AMAZING! I am currently looking at blue for the house color, although I do love the cedar shingles on this house. It's just not to practical in the freezing winters of good old Utah, so Cement fiberboard siding is what we will be using. You can't see in this pic, but this house has 4 porches, including one that is screened and a Pergola patio. (Did I mention Dream Home?) Now on to the main floor plan. Looking at floor plans makes me miss my drafting classes. I wish I would've kept them up, but life is what it is and I love mine so "Oh Well." I love the master bedroom and bathroom in this plan. The bathroom has a giant shower that would totally accommodate my double shower heads and wall sprays with a bench, the wish list goes on and on and on... But then you add a fireplace and a deep tub in the middle. Oh My! It seems a little excessive to have 3 sinks in one bathroom, but luxury is luxury. I'm not in need of a formal dining room so I imagine I would use that space as a sitting area for those very few visits we get from people every year. Plus I could have an awesome themed Christmas tree in there every year! (Good thing my hubby doesn't read this blog.) The home office would be designated as my craft room/computer room. I love the back porches and patio. I love to entertain and this combination works for the many different seasons Utah has to offer. I do think I'll move the fire place over to the corner on the left so it can be used on the patio and the screened porch. I envision lots of fun parties outside at this house. The mudroom and laundry room area are so big I just don't know what I would do with all that space. Oh wait I would love it! The second floor has two bedrooms for the kiddies with a shared bathroom. I like how they each have their own toilet and only share the bath/shower room. That will make it easier for them to get ready in the mornings. Especially since at the rate we are going they'll be teenagers before they have this bathroom. Now as for that awesome bonus room with balcony over the garage. This has so many possibilities. We could convert it into an apartment and make a little money to help with the mortgage. I mean who wouldn't want to live in that sweet space? Or we could look into making it into a fitness and play room. What fun! Hopefully I don't run away screaming from living in our current situation and we make it to our goal. On that note, here's to dreaming. What does your dream home look like? 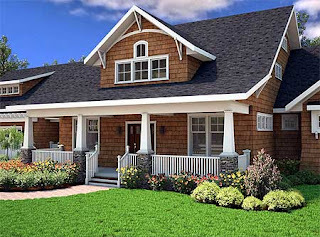 This house plan can be found on Architectural Designs.